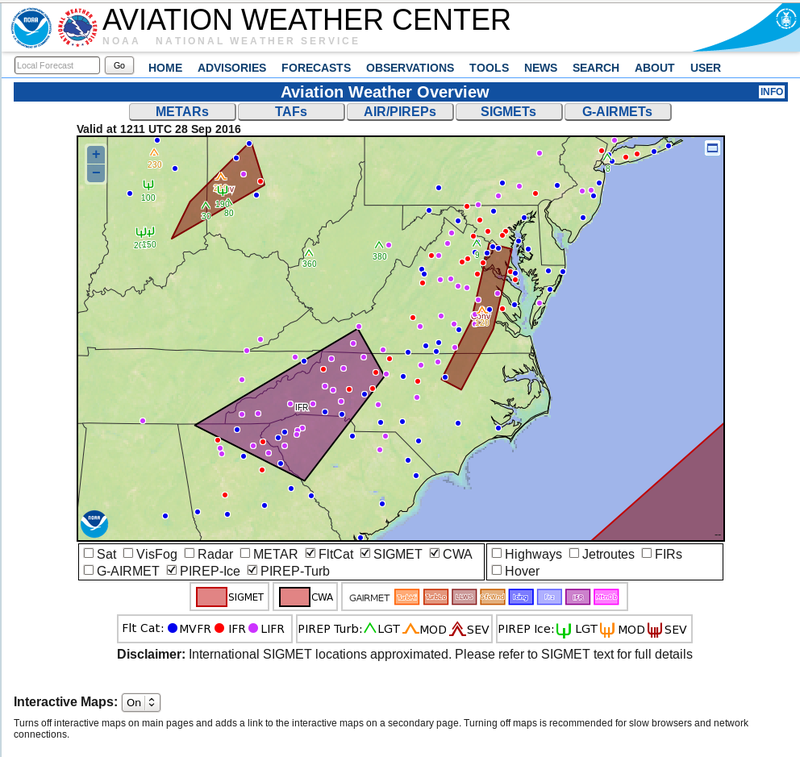 A screen capture from this site at 1215 UTC on 24 June 2016, above, shows IFR Conditions (Red) and Low IFR Conditions (Purple) over the upper Ohio River Valley and surrounding states. The IFR Probability field for the same time, below, shows high probabilities in roughly the same regions that have IFR or Low IFR conditions. The Brightness Temperature Difference field, also displayed in the toggle below, gives little information at this time of day. A benefit of the GOES-R IFR Probability field is that it contains a coherent signal through sunrise. The toggle at 0915 UTC, below, before sunrise, shows a second benefit of IFR Probability fields: a useful signal in regions with cirrus clouds. High clouds, of course, prevent GOES-13 from viewing the development of fog/low stratus near the surface. The Rapid Refresh model data on low-level saturation that are part of the IFR Probability Field computations give quality information in regions of cirrus. In the example below, developing IFR conditions are depicted (the yellow enhancement that shows IFR Probabilities around 40%) over much of northern Kentucky and southern Ohio. This is under a region of cirrus (black in the enhancement used for the brightness temperature difference) north of a convective system that sits over southeastern Kentucky and eastern Tennessee. The waning full moon provided ample illumination for the Suomi NPP Day/Night Band Imagery, shown below, from 0736 UTC on 24 June 2016. The cirrus shield, mid-level clouds and developing valley fogs are all apparent. This entry was posted in Midwest, Multiple Cloud Layers, Suomi/NPP on June 24, 2016 by Scott Lindstrom. GOES-R IFR Probability fields showed large values over parts of Kentucky and Tennessee during the overnight hours on 16-17 February 2016, as shown in the animation above (every 2 hours from 0115 through 1315 UTC). 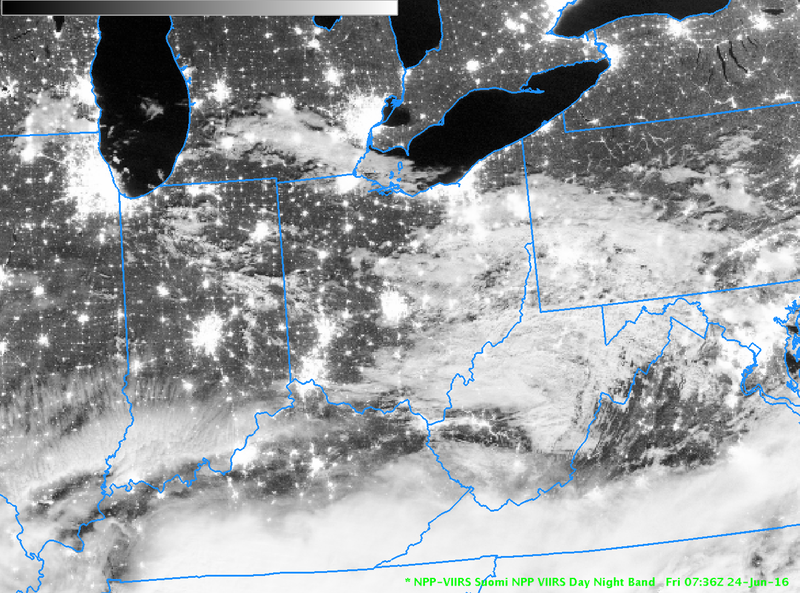 (IFR or near-IFR Conditions were present over the region of enhanced IFR Probabilities) For much of the overnight hours, mid-level and high clouds prevented an unobstructed satellite view of low clouds, so Rapid Refresh model output was the principle driver in IFR Probabilities. When that happens, the character of the IFR Probability field is less pixelated (it’s a flatter field) and values are smaller. At the end of the animation — 1315 UTC — satellite observations of low clouds have improved and the GOES-R IFR Probability field is (1) more pixelated, as expected when satellite data are used and (2) showing higher values because Satellite Predictors can be used in the computation of IFR Probability. MODIS data from Terra and Aqua satellites can also be used to compute IFR Probability fields, and the high spatial resolution of the MODIS instrument (1-km vs. nominal 4-km on GOES) can yield superior results for valley fogs, for example (The effects of some rivers are apparent in the 0354 UTC image over western Tennessee, for example). For a large-scale event as above, however, GOES-based resolutions can be adequate. The toggle of MODIS-based GOES-R IFR Probabilities at 0354 UTC and 0810 UTC is shown below. Patchy clouds (that prevent MODIS from viewing low clouds) are more apparent in the 0354 UTC image than in the 0810 UTC image. Suomi NPP Overflew the Tennessee River valley just after midnight local time, and the toggle of the Day Night band and the Brightness Temperature Difference field (11.45 – 3.74) is shown below. Extensive cloud cover is apparent. The importance of the IFR Probability fields is that it incorporates surface information (from the Rapid Refresh predictions of saturation in the lowest 1000 feet of the model atmosphere) so that fog and low stratus that impacts transportation by reducing visibilities can be distinguished from mid-level stratus that has a smaller impact. This entry was posted in Deep South, Midwest, MODIS, Suomi/NPP on February 17, 2016 by Scott Lindstrom. GOES-R IFR probabilities on Tuesday 9 February captured the development of a small-scale fog event in/around the southern part of Puget Sound in Washington State. The animation above shows high IFR Probabilities developing shortly before sunrise and persisting through most of the day in a region including Shelton, Olympia, Tacoma and Seattle. MODIS visible data, below, from the Terra Satellite overpass shortly after 1800 UTC, below, shows the fogbank over the most of Puget Sound, extending inland only over the southern part of the sound. Suomi NPP viewed Puget Sound on two consecutive overpasses on 9 February, and visible imagery from those passes, just before 2000 UTC and near 2130 UTC, are shown below. Fog Dissipation is apparent in the later image, which is consistent with the animation of IFR Probability at the top of this post, which animation shows IFR Probabilities declining in value after 2100 UTC. This entry was posted in MODIS, Pacific Northwest, Suomi/NPP on February 9, 2016 by Scott Lindstrom. The toggles above (0500 UTC) and below (0900 UTC) show how the GOES-R IFR Probability fields capably screen out many regions of mid-level stratus. This is achieved by fusing the brightness temperature difference information with data from the Rapid Refresh Model. If the lowest 1000 feet of the Rapid Refresh Model is not near saturation, probabilities of IFR conditions are reduced. Toggles from 1200 UTC (above) and 1400 UTC (below) continue to show IFR Conditions mostly confined to regions near the Willamette Valley in eastern Oregon — banked up against the higher terrain to the east of the Willamette, and also over the higher terrain of northeastern Oregon (Click here for a toggle between the 1400 UTC IFR Probability field and Topography). IFR Conditions are a function of ceilings above ground (not above Mean Sea Level), so it’s important to recognize the influence of topographic features on an IFR Probability field. Fog/Low stratus can bank up against a topographic feature, and/or it can shroud the top of a topographic feature. 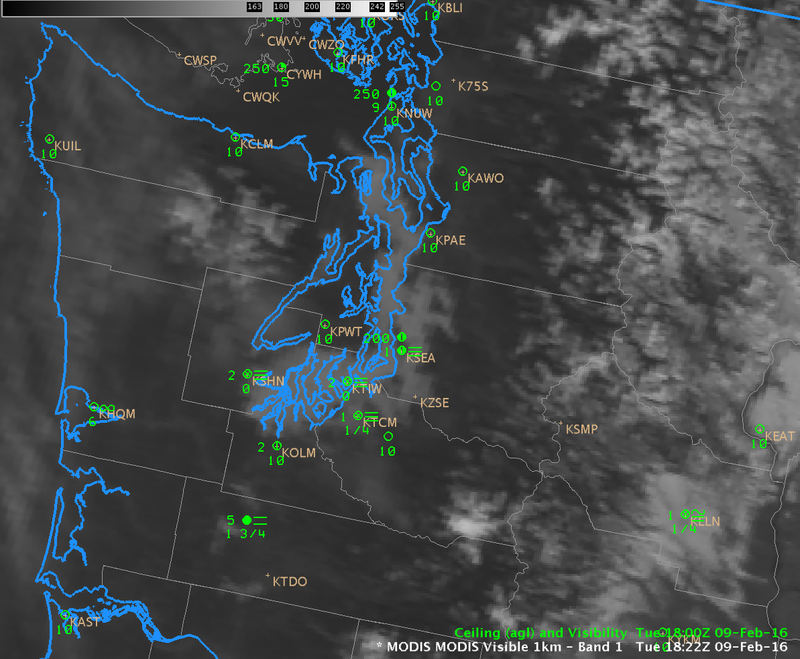 Note also how at 1400 UTC high clouds have impinged upon extreme northwest Oregon and coastal western Washington. In these regions IFR conditions nevertheless persist under the high clouds, but satellite data alone does not indicate low cloudiness. In this region, the inclusion of Rapid Refresh data in the GOES-R IFR Probability algorithm allows the IFR Probability field to continue to provide useful information about the presence of fog/low stratus. MODIS and Suomi NPP afforded high-resolution images of the fog/stratus banks over the Pacific Northwest on 15 December. The brightness temperature difference fields and MODIS-based IFR Probability fields from MODIS at 0533 and 0945 UTC, below, support the observations from the coarser-resolution GOES fields above. GOES-R IFR Probability fields are not yet computed using data from the Suomi NPP Satellite, but the Day Night band and the Brightness Temperature Difference field give information about the presence of cloudiness. For the case of Suomi NPP data, however, it’s more important to consider surface-based observations to confirm regions of low clouds/fog or mid-level stratus. Note also that December 15 was shortly after a New Moon, and the crescent moon that could give illumination was below the horizon (that is, it had set) at 0918 and 1059 UTC. Note that Suomi NPP Near-Constant Contrast Day Night Band imagery was scheduled to start flowing in to AWIPS II on 14 December 2015 via the SBN. 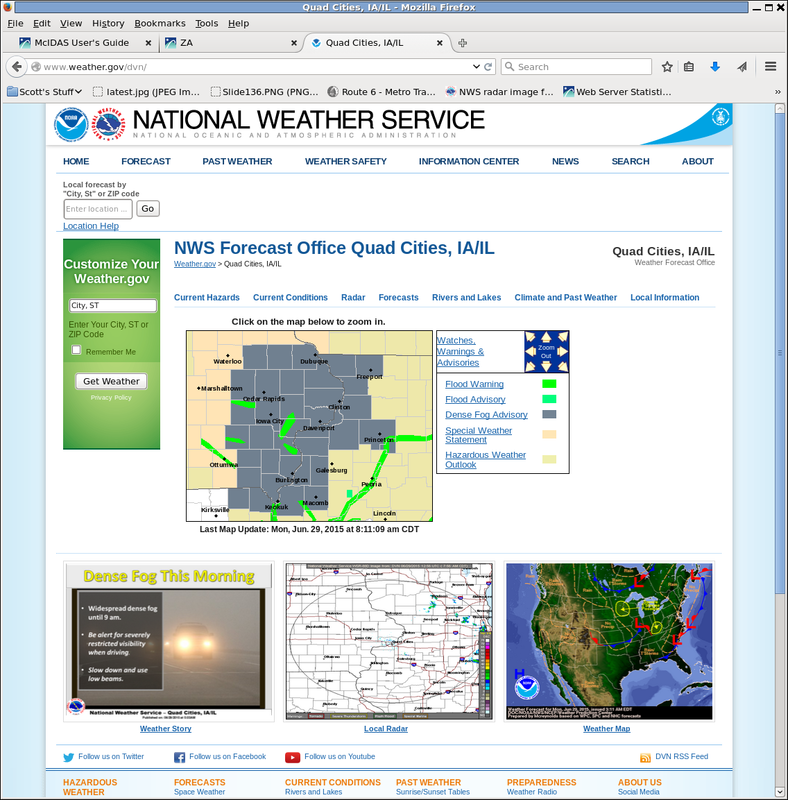 It should be available in NWS offices now. This entry was posted in Day/Night Band, MODIS, Pacific Northwest, Suomi/NPP on December 15, 2015 by Scott Lindstrom. Low clouds (with a sharp southern edge) were over northern Wisconsin during the early morning of 24 November 2015. Are IFR Conditions present? Can you tell from the satellite imagery alone? The cloud bank stretched over northern Wisconsin seems thick compared to the bank of clouds over northeastern Wisconsin (centered on southern Green Bay). The city lights of Duluth are not visible in the same way that the city lights of Green Bay are in the Day Night band imagery. Clouds in general are distinct with the near-full moon providing ample illumination. Both GOES and MODIS Brightness Temperature Difference fields, below, show a signal consistent with low clouds over most of northern WI and adjacent regions. But are there IFR Conditions? IFR Probability fields blend the information available from satellite (are water-based clouds present?) with model output to yield a refined diagnostic of IFR Conditions. If there is saturation in the lowest levels (the lowest 1000 feet) of the model, then Probabilities of IFR Conditions are increased. If the lowest levels of the model are relatively dry, in contrast, then IFR Probabilities are reduced. On the morning of 24 November, the latter condition occurred over northern Wisconsin. IFR Probabilities computed from MODIS and GOES-13 satellite values are shown below. Probabilities are very low over most of Wisconsin where mid-level stratus (with varying bases) was present: IFR conditions were not generally observed in the regions where water-based clouds were indicated by the satellite. Mid-level stratus can look, from the top, very similar to fog, but it’s impossible for the satellite alone to discern what’s happening at the cloud base. Model data helps the IFR Probability algorithm screen out regions where mid-level stratus is occurring. This entry was posted in Midwest, MODIS, Suomi/NPP, Wisconsin on November 24, 2015 by Scott Lindstrom. GOES-R IFR Probability fields are challenged most days by the diurnal penetration of coastal fog and stratus that occurs overnight along the California Coast. In the animation above, IFR Probabilities increase in regions along the coast, and also in valleys (such as the Salinas Valley) where fog moves inland. Note above how Monterey, Watsonville and Paso Robles all show IFR (or near-IFR) conditions as the IFR Probabilities increase. The same is true farther north at Santa Rosa and at Marin County Airport, and farther south at Avalon, Ontario, Point Mugu and LA International. IFR Probability fields routinely do capture these common fog events. The Brightness Temperature Difference Field (10.7 µm – 3.9 µm), below, captures the motion of these low clouds as well. However, numerous ‘false positive’ signals occur over the central Valley of California (likely due to differences in soil emmissivities). The GOES-R IFR Probability field can screen these regions out because the Rapid Refresh data in the region does not show saturation in the lowest kilometer. Note also how the Brightness Temperature Difference field gives little information about low clouds where high clouds are present (over the Pacific Ocean in the images below). IFR Probability fields, however, do maintain a strong signal there because data from the Rapid Refresh strongly suggests the presence of low clouds/fog. Suomi NPP makes an overflight over the West Coast each day around 1000 UTC, and the toggle of the Day Night Band and the Brightness Temperature Difference field (11.45 µm – 3.74 µm) is shown below. The moon at this time was below the horizon, so illumination of any fog is scant; the brightness temperature difference field does highlight regions of water-based clouds (that is, stratus); however, it does not contain information about the cloud base. In other words, it’s difficult to use the brightness temperature difference product alone to predict surface conditions. GOES-14 is in SRSO-R mode, and its view today includes the west coast. The animation below shows the erosion of the fog after sunrise at 1-minute intervals. (Click here for mp4, or view it on YouTube). (Click here for an animation centered on San Francisco). This entry was posted in California, Day/Night Band, Suomi/NPP on May 29, 2015 by Scott Lindstrom.